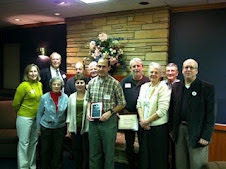 PLEASE USE www.EuclidCreekWatershed.org TO GET THE LATEST INFORMATION AND NEWS ABOUT THE FRIENDS OF EUCLID CREEK. Please see the following site for the blog maintained by the Cuyahoga Soil & Water Conservation District. Please join us as we enjoy our final 15th Anniversary hike in the Euclid Creek Watershed. We will hike two and a half miles at the Acacia Reservation in Lyndhurst. Get the latest update on the Cleveland Metroparks' plans to restore the former golf course at Acacia from Jenn Grieser, Senior Natural Resource Manager--Urban Watersheds, Cleveland Metroparks. And, see how the landscape has changed since Day-in -the-Life in July, with the beautiful Fall colors now on full display. ALSO, immediately following the hike please lend a hand, and a strong back, to help the Metroparks plant trees on the northern portion of the Reservation. The tree planting is scheduled to take place from 11:30 to 2:30 (ish). 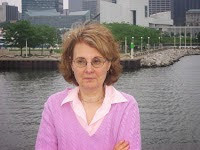 Who: The hike will be led by Jennifer Grieser, Senior Natural Resource Manager--Urban Watersheds, Cleveland Metroparks. Meeting Place: Please meet on the sidewalk behind the former clubhouse near the start of the trails. Please note some of the sidewalks may be closed due to construction. Join FOEC for our last hike of the year celebrating our 15th anniversary. This is the sixth hike in our series of Fifteen Miles with Friends. This is a 2.5 mile hike at Acacia Reservation that will track progress on massive stream restoration work started this Fall that is led by Cleveland Metroparks. Friends of Euclid Creek - 2001-2016 - Walk 15 miles with us to celebrate our 15th anniversary. October 6, 5 - 7pm, Mayfield Village Community Room - A conservation and conversation event for citizens, partners, and city officials. Help us celebrate the 15-year anniversary of Friends of Euclid Creek by joining us on June 18 for our 2nd hike in the watershed. We'll be touring the former TRW site, now the Cleveland Clinic-Lyndhurst Campus to explore this diverse site located on the Main Branch of Euclid Creek. The hike will range from paved to dirt paths and from flat terrain to some hills. The pace will be moderate. Check the 15 Year Anniversary Webpage details closer to the date for parking information and more details. Questions? Please contact Christi Carlson at 216-509-3324. It is time for the Friends of Euclid Creek Annual Picnic and General Meeting, and this year promises to hold some surprises! The picnic/potluck is an opportunity for networking, a chance to explore the Euclid Creek Reservation at Wildwood Park, and to taste the delectable treats that our members and guests always prepare for this annual affair. FOEC will supply pizza and beverages, while all guests bring a dish to share, whether it is a dessert, side dish or salad. This year we are striving for a ZERO WASTE event. So, we ask that you bring your own reusable table service (plate, tableware, utensils and cup). Please no disposable plastic ware! We will provide a place for compost. Please note that the time is moved up by one-half hour from our normal meeting time, and the location is new. Located at Lakeshore Blvd. and E. 174th St. The meeting will include elections of new officers. Only members can vote for new officers, so we encourage you to renew your membership at the meeting to enjoy the privilege of voting. Please join us for this fun and pleasant evening in the park. Please contact Christi Carlson with any questions at 216-509-3324 or by e-mail: friendsofeuclidcreek@gmail.com. 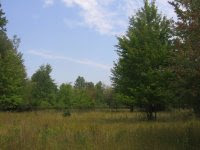 FOEC purchased a conservation easement with the dusty goldenrod meadow that is part of an area that is environmentally sensitive. Thank you to Frank Skala for the photo from the FOEC visit to the VFW site on White Road. We are still asking for donations for our current land acquisition initiatives. Click HERE for more details about the Richmond Run property we are preserving. Click HERE to access our Donate feature. The work of the Friends of Euclid Creek is made possible by a grant from the Northeast Ohio Regional Sewer District. Please let me know at jeanette.evans@sbcglobal.net if you have any questions about any postings. 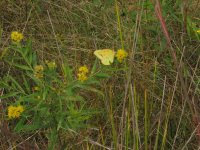 Dusty goldenrod can attract a yellow butterfly. The Friends of Euclid Creek help inform and educate the public on the many things happening in the watershed. Be part of its future by joining and supporting FOEC. Lower Euclid Creek Greenway Project - Identified restoration projects and greenway improvements for public access to creek in lower Euclid Creek segment. Funding came from ODNR-Coastal Management Assistance Grant. Euclid Creek Watershed Signage - FOEC received grant funding to design and install signage raising community awareness throughout the watershed and created brochures about Euclid Creek. Funding came from the OEPA-Ohio Environmental Education Fund. Rain Garden Implementation Project - Evaluated benefits and challenges of rain gardens in Euclid Creek and installed four demonstration gardens with educational signage in watershed communities. Funding came from the Ohio Lake Erie Commission and Lake Erie Protection Fund. Wetland Inventory - identified and mapped priority wetlands in Cuyahoga County for conservation and restoration, completed in 2006. Funding came from the Great Lakes Commission. Euclid Creek Watershed Guide (Cuyahoga County Planning Commission) - Overlay of Watershed Action Plan to develop greenspace priorities for recreation and conservation, completed in 2006. Funding came from ODNR-Coastal Management Assistance Grant. Euclid Creek Volunteer Monitoring Program - purchased equipment to start up volunteer monitoring program, completed in 2005. Funding came from OSU Extension Watershed Team & CREES Great Lakes Regional Water Quality Program. Euclid Creek Maps - provided maps to communities and residents to educate about watershed, completed in 2005. Funding came from Legacy Village Change for Charity Foundation. Headwater Stream Evaluation - Cleveland Metroparks performed HHEI on 100 segments of headwater streams in Euclid Creek to help in prioritizing restoration and protection strategies. Riparian and Wetland Setback Ordinances - Encouraging communities to adopt an NOACA model ordinance to protect riparian and wetland areas and provide technical reviews of any ordinance modified (City of Euclid and City of Richmond Heights passed the ordinance).